Most of pallets composed of hardwoods like pine wood and oak wood, that’s why the pallet boards are always capable to bear lot of weight over and also to live longer! Here some oak natured pallets have been reinstalled for this brilliant DIY pallet long coffee table output, has extra long wooden top finely trimmed down and also have a textured look due to arty style filling of pallet wood stripes! Sometime we have more people to entertain in our living room, the larger dimensions of this coffee table would all make it easy! Base frame of this coffee table, comes with robust wooden legs, strengthened more with additional cross beam supports! Two different dark and light tones of wood, enhance the visual to peak and accent side trimming of top and finely cut thicker legs are also responsible for its so enchanting appearance! It is definitely going to give warmth and a fab wooden touch to your living room ambiance along with establishing sophistication there! 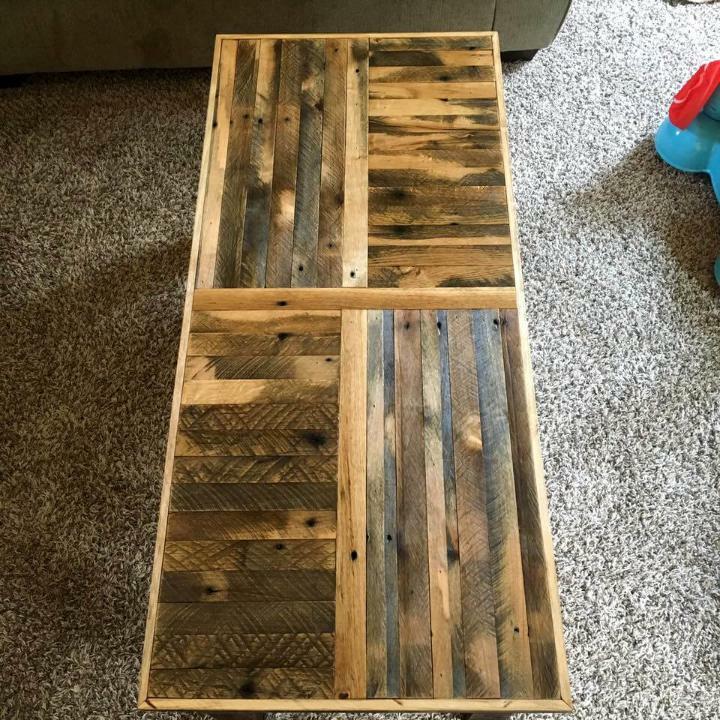 Here oak pallets have been reclaimed for an art style construction of a DIY coffee table! For table top, first of all a big long frame has been constructed as per demands of a longer wooden top! For a stylish patterned top, the frame has been divided into 4 equal parts and each of them has been filled through different styled flat packing of pallet slats, so it results into a beautiful robust wooden top! 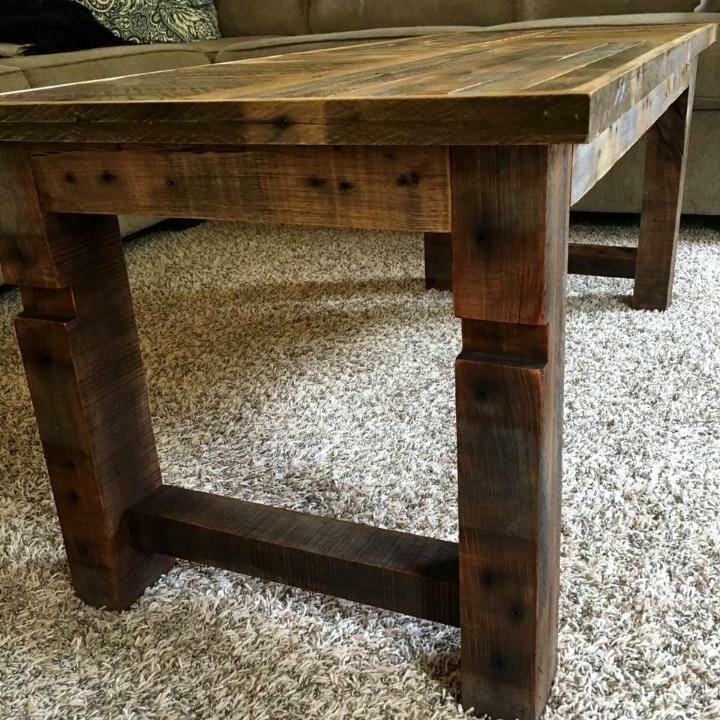 Finally this patterned rustic oak pallet wooden top has been put flat over some robust wooden legs, supported with additional cross wooden beams, and hence a perfect XL size of coffee table has been got to add to the center of living room sofa! 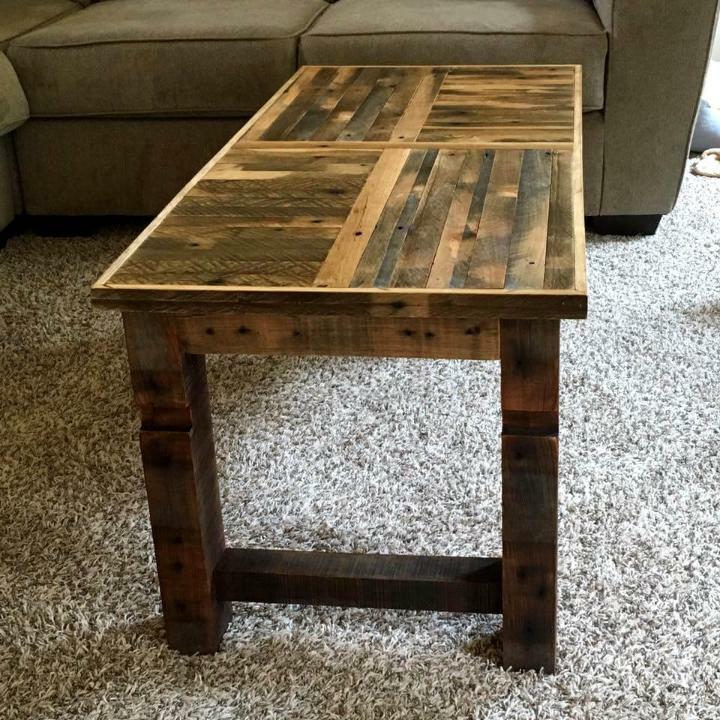 You will also like these unique DIY furniture projects.